Preheat the broiler. Place the poblanos on a baking sheet. Broil until blackened on all sides, turning occasionally to blacken all sides, about 5 – 7 minutes. Remove from broiler, reduce oven to 375°F and cover poblanos with a towel; set aside to steam, about 3 minutes. Peel off blackened skin, stem and seeds and dice. In a large nonstick pan, heat oil over medium-high heat, add chorizo and cook until fully cooked, breaking up with a wooden spoon, about 4-6 minutes. Remove from pan and place on a paper towel-lined plate to drain. Wipe down pan, return to heat and add olive oil. Add onions, sauté until light and translucent, about 3 minutes, then add garlic and mushrooms, salt, pepper and cumin and sauté until golden and cooked through, but still retain their shape. Add the Holland House® Sherry Cooking Wine and toss, continue to cook until absorbed. Return chorizo to pan, add diced roasted poblanos and ½ cup of cilantro, stir to combine. Combine the lard, baking powder and 1 tsp. salt in a large bowl and mix with a wooden spoon until combined. Whisk the masa harina, 2 cups hot water and the broth in a separate bowl; add to the lard mixture and mix until smooth, then combine filling mixture with masa mixture. Run banana leaves under warm water until soft and pliable, line a 9x13 pan by crossing one over the other and spoon in masa mixture. Fold the banana leaves over the filling, tucking them in to seal. Cover with aluminum foil and bake until the filling is set, about 1 hour and 15 minutes, uncovering halfway through. 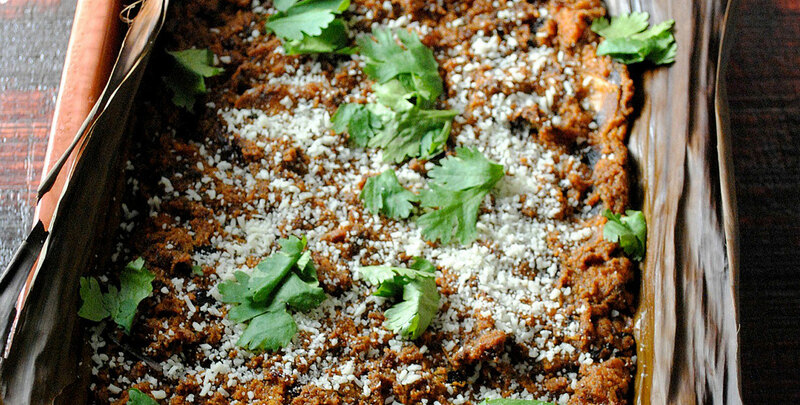 Serve warm, garnished with cotija cheese and remaining ½ cup cilantro.